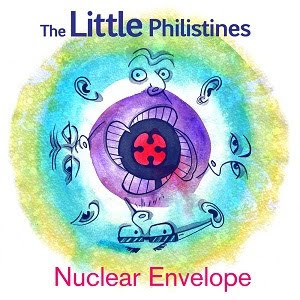 It's hard not to enjoy a hearty piece of spirited indie-pop, and London five-piece The Little Philistines have come up with the goods here - 'She's My Food' is the anthemic opener to their forthcoming album, 'Nuclear Envelope'. (Science fans may recognise this by its more common name, the "nuclear membrane".) Listen to the track below. 'She's My Food' is romantic reconciliation at its neediest, with some lyrical gems like "I could be your King but you'll always be my Ace". This despite the track's considerably lively instrumentation - including pugnacious strings and bold brass - set against the joyously melodic vocals. I might be more confused if I wasn't so giddy. The band celebrate the launch of their new album Wilmington Arms in London tomorrow evening, along with fellow FG faves Bordeauxxx. And while we're plugging away, I may as well recommend checking out band member John's drawing skills. Genuinely quite the artist. 'Nuclear Envelope' is out on Oct 8th, and can be pre-ordered at Bandcamp. Find more info at facebook.com/thelittlephilistines.